Nigeria and Iran continue to perform strongly for MTN but in its home market of SA, where the market is fast maturing, growth is stalling. MTN is performing wonders in Nigeria, where it now has about 27m subscribers, or more than twice the number of customers it has in SA. But back home, the group has fallen short of expectations, missing its own targets for growth. 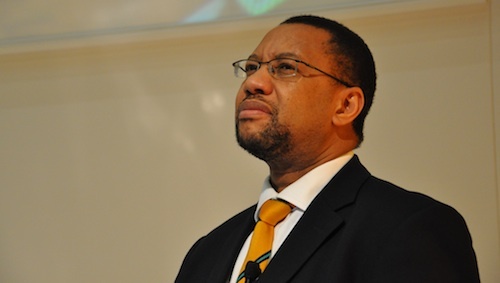 “This has been the most difficult six months in SA’s history,” says MTN Group president and CEO Phuthuma Nhleko (pictured), who blames the worst economic recession in years and “operational challenges” for the difficulties. In the prepaid market, competition intensified dramatically, with rivals Cell C and Vodacom discounting handsets into this market to boost market share. Churn rates sky-rocketed as a result, with average revenue per user (Arpu) plummeting to R136 from R148 a year ago. Pre-paid Arpu declined from R97 to R92 and post-paid Arpu went from R403 to R362 as consumers felt the recession’s bite. SA prepaid subscriber numbers fell, from 14,4m to 14,3m while post-paid customers increased only marginally to 2,9m. Nhleko estimates the local operation has shed about 1,5 percentage points of market share. He says new legislation in the form of Regulation of Interception of Communications and Provision of Communication-Related Information Act (Rica), in terms of which cellphone Sim cards have to be registered, has also contributed to the slowdown in subscriber growth, and this is likely to continue. The slowdown comes as MTN ramps up its capital expenditure in SA — building fibre infrastructure and rolling out more 3G base stations to keep pace with rival Vodacom. The company’s 3G masts now cover 44% of SA’s population after it added 307 new 3G base stations. It spent R4,9bn on new network infrastructure in SA in 2008 and is likely to spend even more in 2009. In the first six months of 2009 it has spent R3bn. Nhleko says the worst is not yet over for MTN SA. “Most probably there will be a few more tough months ahead but we are top of the key issues to ensure we maintain our competitive position,” he says. Elsewhere, though the group is doing well in the 21 territories in which it operates — with the exception of Sudan. Nigeria is now the flagship business, contributing more than twice what SA does to earnings before interest, tax, depreciation and amortisation (Ebitda). Ebitda margin in Nigeria is a startling 61,5%. MTN’s third key market, Iran, where it has a 49% stake in MTN Irancell, is also growing strongly, though Arpu is low at just US$8. Irancell has 19,1m customers in a market of 72m people. Its market share is 37%. Group-wide, MTN has 103m customers. I am happy that MTN’s new price plans, which are based on rand value and not minute based are losing them customers. Initially when I saw this I thought to myself, How stupid do MTN think we are. I have personally discontinued contracts based on this fact as these new contracts are a complete rip off. The arrogance of the cellphone companies will come back to haunt them over the next few years when the market is saturated and customer service will be the only unique deliverable to the market. Something that these companies are forgetting is that consumers still have the financial power is sick and tired of being taken for a ride. MTN is losing business because of its contempt for its customers – simple as that. MTN is STILL facing serious issues with billing and even basic service delivery. I cannot see local MTN growth with these issues not being addressed. MTN is a bad choice, with bad service and a serious lack of respect for its customers. I predict it will loose a lot more contract subscribers in the future as contracts expire. Both mine expire next year and I will not renew them after 12 years or so of misplaced loyalty. I am not sure who I will turn to for my future needs though. Cell C? Virgin Mobile? Vodacom? All of them have service delivery issues if Hello Peter has to be believed. Then again none of them seem to be as bad as MTN….